BURBANK, CA/USA: February 21, 2016- Close up of sign warning of restricted items. 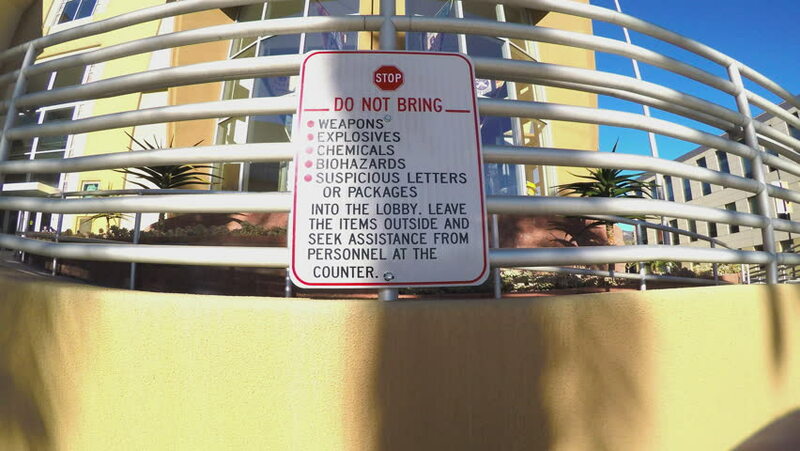 Warning sign not to bring explosives, guns, biohazards or other suspicious items into a government building lobby. hd00:11Man inserts coin into a pay phone, listens/dials, and finds that the phone is not working, tries to get money back with coin release lever, and hangs up. 4k00:18NEW YORK - AUGUST 20, 2015: 5th Ave sign with one-way arrow for traffic and taxicab driving in Manhattan NY. Fifth Avenue is a major thoroughfare in Manhattan NYC. hd00:08Hong Kong - February 2011: Hang Seng Bank office building in business district of Hong Kong.